Canada receives 250,000 newcomers per year and is regarded internationally as a model country when it comes to integration. The Dutch government copied the citizenship ceremony from the Canadians. All rise for a citizenship ceremony in Hamilton, Ontario. Full of anticipation, about 30 immigrants sit in the first few rows of chairs in the gymnasium of an elementary school in Hamilton, Ontario. It is a diverse group, with people from 22 different countries, including China, India, Afghanistan, Mexico, Syria and the Philippines. They are about to become Canadian citizens. Some have dressed up for the occasion. Most, however, are in casual wear. They have already received a small Canadian flag, and a card with the lyrics to the anthem, O Canada. When they leave this room, they will be Canadians, naturalized during a citizenship ceremony. Participants in a citizenship ceremony in Hamilton take the oath. Across Canada, nearly 3,000 citizenship ceremonies are held each year. The country of 30 million people accepts about 250,000 newcomers annually, without major problems. They are encouraged to apply for citizenship. About 160,000 do so every year. During the ceremony, new Canadians are officially welcomed as full citizens and reminded of the basic values of Canadian society. Ceremonies have been held since 1947, the year in which Canadian citizenship was created (before that time, residents of Canada were British nationals). 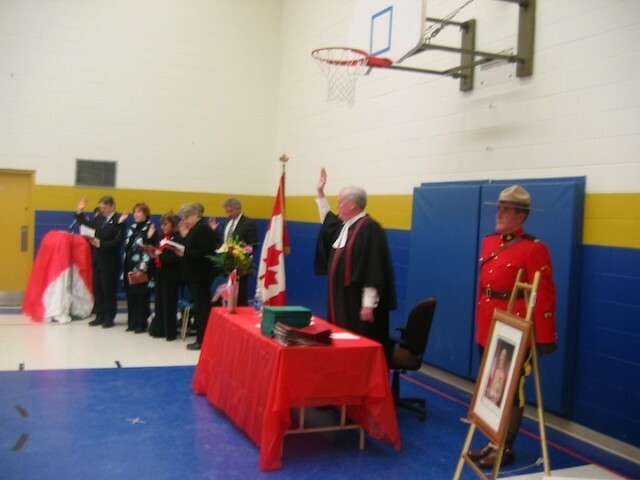 Typically, citizenship ceremonies are held at a local immigration office, but they can also be organized in other places, such as schools. “It brings it home to other people as well,” says Allen Rodgers, an officer of the Royal Canadian Mounted Police, the Mounties, who will stand guard during the ceremony. All rise! someone suddenly proclaims. The citizenship judge enters the room. He is not a real judge, but a member of the Order of Canada. In this instance, the judge is Robert Marrow, a former mayor of Hamilton. He takes a seat behind a table at the front of the room, flanked by Rodgers in his scarlet Mountie tunic, a portrait of Queen Elizabeth II, the Canadian flag, and two clerks. Citizenship judge Robert Morrow at the front of the room during a citizenship ceremony. Then it’s time for the oath. Everyone stands, holds up their right hand and vows allegiance to the Queen, first in English, then in mumbled French. “You are now Canadian citizens,” says Morrow. “Congratulations.” There are cheers and applause. Then, one by one, the candidates are called to receive their certificate, and to shake hands with the citizenship judge, the Mountie, and the clerk. Some have their picture taken with them. Finally, the anthem is sung: O Canada, we stand on guard for thee! Is that ‘eerily nationalistic’, as critics of the naturalization ceremony in the Netherlands have said? It’s not that bad, in a school gymnasium where the citizenship judge sits under a basketball hoop and school children offer homemade cookies and fruit punch to the new Canadians. Many of them stand around chatting following the ceremony, their certificates and winter coats in hand.